I think in this picture that I am doing some weird arm cheer because we had just finished our second interval. Thanks Janice for the pic! Janice has completed 26 marathons and another one of the girls with us has done 25 marathons…I am learning a lot from them. I decided that since I was running 13 miles with friends this morning that I would do 5 more after to turn it into my long run for the week. We did the first 7 at about an 8:15 pace and then started the workout. Yes. That is snow. It is September. I got these North Face gloves for running yesterday at REI and I really like them because you don’t have to take your gloves off to use a touchscreen and my phone fit perfectly inside of my glove when it started raining. Win. FMWs (frosted mini wheats) right when I got home and turkey, bacon, avocado salad and lots of bread for lunch. Brooke really likes our lunch dates. This alert on my computer made me very happy this morning. Bangs Friend will be here tomorrow. PS someone emailed me asking about why I call this friend of mine Bangs Friend and it started a year ago when I met her and really liked her bangs…so her name is now Bangs Friend. Hope you are having an incredible day!!! Fill me in on what you ran and what you ate! What a great running crew! Sounds like a stellar workout! Way to go! And I did a back-to-back spin-treadmill workout today. I love that you have a running crew now too! I hope you and Bangs have a great time! I didn’t run today but I have 10 scheduled for tomorrow :). I just had peanut butter and banana for a snack…I looove peanut butter! That is an awesome 18 miler!!!! I am jealous of your running crew! I want someone to do my long runs with REALLY bad!!! I did 8 easyish miles…about 8:05 …but I should have done them at 8:16. I ate a peanut butter sandwich, goldfish crackers, grapes, a banana, chocolate milk, a string cheese and some pb m&m’s :)! Today I did the elliptical because my IT band is acting up- super boring. I had a cheddar,spinach, tomato omelet that was super tasty for breakfast. Right now I’m drinking a cherry slurpee! That is a lot of marathons! I wasn’t going to run today but I got talked into a running group tonight. Yay! Way to get in 18! You’re awesome! I’ve got 20 first thing tomorrow after I drop off my girls. Gulp! I enjoy your blog. But seeing you misuse run/ran over and over again makes it difficult for me to continue reading. This is mean as constructive criticism and is not intended to be mean or disrespectful in nature. Hey! Thank you so much for pointing that out! Just fixed it:) Have a great day! *and no one is perfect. I love the alert on your phone, great work on the long run!! I ran 3 miles this morning 28:18, 8 seconds faster than last week. I had a PSL this morning first thing. Wrap with spicy hummus, spinach, turkey, mozz cheese, red pepper and avacado. Making baked potato soup for dinner! Woohoo for friends coming to visit!! Yay for 18 miles! Yay for Bangs Friend coming. I hate to critique but the “I have run (past participle)/I ran (past tense)” grammar really sticks out for me (I have graded too many papers in my life!). I am a believer in correct English; regardless, I will continue to read about your awesome adventures. Oh sorry-you fixed it. I will now crawl into a hole. Hahahah! No worries! I wrote this post way too quickly and I should have noticed the mistake in the first place. Have a great day! I totally understand about writing fast! Thanks for not getting annoyed at the grammar nazis! Being a mom to a young baby, running, going thru everything what you are going thru, I give you credit for getting half these posts out at all. From a mom to another mom, you are doing just fine, grammar errors and all. Goes to show you, what is important to some just not for others. Enjoy time with your friend this weekend. That is awesome! Remember that I was there too! I have been running for 15 years now. You are doing awesome! Wow what a great 18 mile run! I did an easy 7 miles today, not too exciting. Hope you have a great weekend with Bangs Friend! Yes yes yes! You really should! That salad looks delicious and did you know that I have a bangs friend of my very own (inspired by your blog but she does have great bangs)? I do and she’s awesome and thank you for the idea. You truly enrich my life. This is 100% serious. HA! I WISH my 18 miles looked like that. Sounds like a great run. Enjoy your time with Bangs. I understand you can’t control yourself. Ps… I’m a winner! Still talking in this pic. Sabotage! Wow Janae that’s an incredible long run! I can’t wait for you to destroy your marathon in December!!! Great job with that 18 miler. You have got this marathon on lockdown. Those ladies sound truly inspiring. Hey you! We need to get together! I am training for CIM! I rode 8 miles on my bike today and ate a delicious avocado and cheese sandwich. Seriously, so simple yet so yum. That’s crazy that it’s already snowing there! I live a few hours from Tahoe and it snowed there too. I guess it’s just early snow year maybe? Holy Moly, that is one heck of a long run, congrats! Yeah! Bangs! Tomorrow! So happy for you and Brooke to see your buddy. You are an awesome runner too. How do you work through the burnout times? While I know this time must be sooo hard for you, your running seems to have really taken off which is amazing! Awesome long run! I ran 6.3 on the treadmill and just about thought I’d die! Today’s eats included banana chocolate chip bread and chocolate milk (post run) and I will have turkey burgers with roasted acorn squash for dinner. Can’t wait! I missed my run today :( I woke up with sore shins this morning and thought that I maybe should take today off, but I really did miss my run. You always talk about your “fast running friends” …UM….YOU are one of those fast ladies. Way to rock your run! Oh my goodness, Brooke’s hand in your lunch photo and her shoes are too cute! It’s been a hodge podge of random food today and a mediocre 2.5 mile run. It’s been a long week! Whine, whine and pity for me. Every time I tried to get out the door I was thwarted. Love my kiddos but clearly not destined to get a run in. Tomorrow is another day. Determined to get a run in. I can’t even run that fast in my dreams… Excellent efforts ladies! Today I went to a local pizza place that I haven’t been to for EVER… it was a fear food. But today it was delicious and I enjoyed it with my good friends! I ran a quick 4 miles on the treadmill while the girls napped. Have fun with Bangs! NICE 18 miler!!! I need some winter running gloves and I have yet to buy a pair that have that “special finger” for your touch screen phone…good idea. I really LOLed on the picture of your lunch with Brooke’s little hand. She’s so cute. I have those North Face gloves too and love them! I also have an 18 miler coming up soon and I’m so nervous…eek! No run for me today–I’m getting ready for an unofficial half tri on Saturday! It’ll be my first tri ever, and even though it’s not a race, I’m pretty nervous because I have no idea what I’m getting myself into! I love how you run 7 miles and then start your workout. I am definitely not a distance runner, so that blows my mind haha. You are awesome! So nice that she is able to come visit you! Your snow pics make me miss the mountains. But not the snow! Never the snow. My run today was a trail run in the woods this afternoon after work. My oldest daughter and our puppy joined me. It was a perfect 82 degrees and a great run that I needed. Whew, you ladies are speedy! Congrats on your long run! I meant to run but it was 5 degrees (Celsius) today and I have no warm running gear so instead I did weights. And then went shopping and bought brooks utopia thermal tights and a cute under armour hoodie. So I’m set! I just got back from dinner with friends and ate fish and chips and French toast for dessert haha. Now I feel sick and need to sleep off the food lol. Oh that pic of brookes little hand coming in to grab that bread is precious! I love it when you call your friend “Bangs”, makes me laugh! Hope you both have an awesome visit! Oh man, that is one tough workout. You ladies are amazing. You have one heck of a good looking crew there. :) Wish I could come hang out. HUGS! Have fun with Bangs!!!!!! Sweet post, Janae :) My favorite find this past week at local oraganic bakery: espresso vanilla bean almond butter. Also, while grammar is important (and so many readers have decided to point it out), I think when it comes to blogging, and life, there needs to be grace :) So, whether past or present tense, thank you for sharing your life with us! Mmm, I made these flourless peanut butter toffee cookies… TASTY DOUGH. Whew those are some speedy paces! I overslept so I didn’t get my run in this morning. I’ll have to go to the gym tonight, so I figure treadmill springs and strength training will work. I wish I knew that many people to run long runs with! Then again, i can’t really complain too much since my mom usually bikes with me while I do my long runs. I had quesadillas yesterday that were pretty fantastic. Gah! That picture of Brooke cheering totally just brought a smile to my face. And I seriously need a pair of those gloves… nothing worse than freezing your fingers off when you need to get something done on your phone. I haven’t run at all lately because I’ve had parent-teacher meetings every night this week…I’m sure you remember those from when you taught, too! :) I’ve been trying to do indoor workouts since it’s also been pouring when I get home, but last night I just said screw it and went straight to bed. Some days call for that! congrats on your 18 miler! 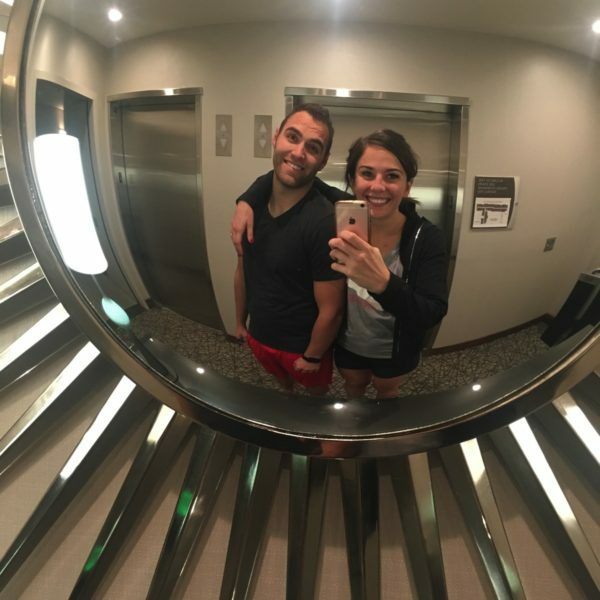 you’re such a rockstar lately with these long runs! That’s one fast 18-miler! Nice job! I hope you didn’t Snooze on Bangs friend coming! haha! 18 miles- thats amazing! I don’t think I could walk 18 miles! Great Job! How did you hydrate and fuel during your run? I see no fuel belt or water bottle on you? ?